Sometimes, especially when I’m watching football, I crave things that really aren’t very good for me. Football, wings, and pizza just seem to go together. When I saw this recipe for Turkey Tenders that promised lots of crunch without much fat, I knew I had to try it. The Grillmaster really liked these bite-sized bits of crispy, juicy turkey breast. “These are good,” he said after his first bite. “These are really good,” he mumbled later while he was shoveling them into his mouth. I served them with light, fruity Mango Dipping Sauce and I’ve also tried them with leftover dressing from Mango Chicken Salad with Cashews. Both worked really well. Did I mention how much kids love these turkey tenders? Preheat oven to 425°F. Halve tenderloin lengthwise, then cut into 2-inch pieces. You should end up with about 20 pieces. Place flour on a medium plate. Place egg substitute in a shallow dish or pasta bowl. 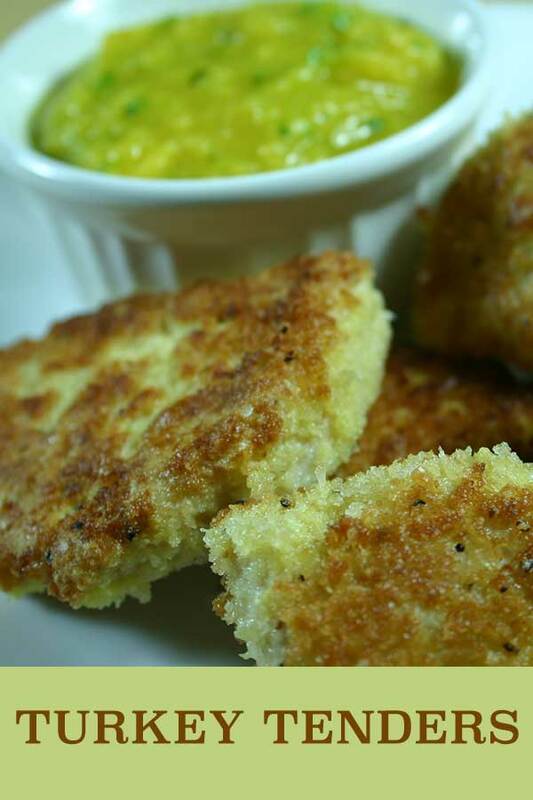 Combine panko, Parmesan and garlic pepper on another plate. 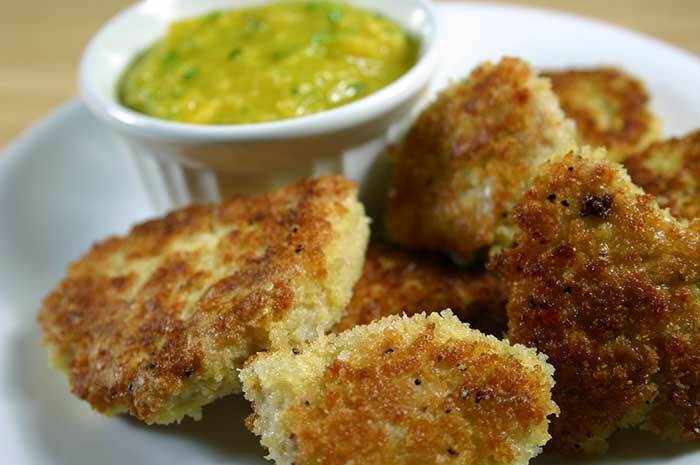 Dredge each piece of turkey in flour, then dip in egg substitute, then dredge in panko mixture. Heat oil in a nonstick frying pan. Add turkey pieces to pan, a few at a time. Cook for about 2 minutes on each side, then place on broiler pan. Bake for 5 minutes, then turn turkey over and bake another 5 minutes. Serve with your favorite dipping sauce. Serve with Mango Dipping Sauce. These look delicious! We love turkey. Love the recipes — but They won’t print out. Michael – If you click the “print” button in the recipe area (under the small photo), it doesn’t bring up a printer-friendly version to print? Would you let me know what type of device/browser you’re using?